Is this why you're yelling at your kids? 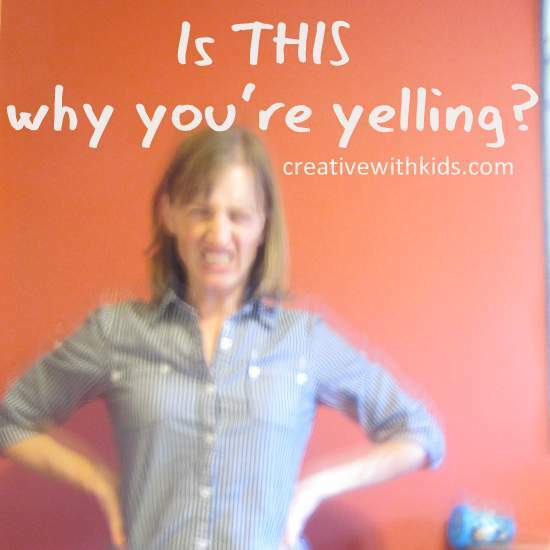 Is this why you’re yelling at your kids? You think you’re holding it together…you’re trying to keep your cool, and then WHAM, all of a sudden you’re yelling at your kids. Sometimes our anger seems to come out of nowhere – something completely normal for our kids to do pushes us to yelling when the day before we would have just laughed at the same situation. We shout and then think, “Where did that come from? ?” Many times it’s not even your child’s actions that actually caused your anger. You might have had one or more background anger triggers heating you to a simmer before your child ever pushed you over the boiling point. We are human. It is perfectly acceptable to have a few QUIRKS, some things that just cause you to be more grouchy, more likely to be angry. When you know what triggers your anger you can be proactive about these triggers and prevent them from causing you to lose your temper. We tend to try to help our kids with their surroundings and food choices and forget that we’ve got to take care of ourselves too. Just because you’re a parent doesn’t make you impervious to annoyance, and your kids are not going to pipe up to give you permission to take care of yourself. 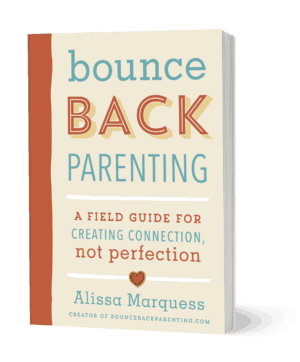 You’ve got to know what is likely to send you over the edge and do something about it so that you can make good parenting choices. When we notice what makes us edgy and uncomfortable, we can make choices that will help us stay centered. 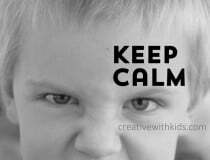 When we know our anger triggers we can do something about them before we yell at our kids. What about you? Do you have a few anger triggers? Do you feel bad about stopping to take care of yourself? 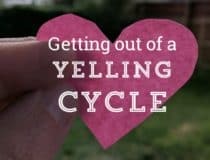 I’d love for you to leave a comment about how you can be proactive about stopping the yelling by taking care of yourself. Leave us a note below! This is so true…I can’t handle too hot temperatures. So often while working in the kitchen in summer I found myself getting mad at my husband for no apparent reason…then I would go and check the thermostat and find it in 80s. Once I set it to cooler temps my anger at my husband would also dissipate. I will try to observe more about other triggers. Noise is the number one thing that sets me off! I try to send the older two boys outside. Afternoons are tough right now with this heat. It makes me grumpy. I have a sound sensitivity too. Playing around, certain toy noises, combined with other house noises, eg the fa n while cooking, someone pushing around chairs, etc…. ecentually I can snap. Something I’ve found very helpful has been to simply put a small piece of tissue in my ear. It doesn’t block out the sound completely-that, to me, would be rude to my kids or asocial. Also, it’s not so obvious, that is, you don’t see tissue hanging out of my ear. But what it does is “lower the volume.” I still hear them and engage, but it’s amazing how much more peaceful things seem and feel- inside and out. Try this, it can really help, and it beats telling the kids to turn it down all the time when they are just having fun being kids. Hormonal.. 100% One week every month.. Sorry.. it’ true.. OH and low blood sugar. No need to apologize – I can’t believe I forgot to put hormones on the list! SO since you know this about yourself, the trick is, what can you do to prevent that from causing you to be angry at the kids all week? Are there ways to make other parts of your life more easy at that time so that you don’t lose your temper? Hunger and exhaustion! Those are the top two. I’m very amicable and open to almost anything when I’m not under the control of these two “demons.” I can deal with being tired, a few minutes here and there on the couch, no biggie – drop dead, haven’t slept in days, kids running around since 6 am ’till 9:30 pm for a week exhaustion, not so much…oh and H.U.N.G.R.Y. FORGET IT! It took me years to figure this out! Because I come from a long line of women who don’t eat until 3pm, until it’s all done, I don’t recognize the physical i.e. stomach pangs, watery mouth ect. signals. What I do recognize is that point where something small like the water being left on the table, infuriates me…then I’m like ok, time to put something in the pie whole…good thing is that I’ve finally recognized it and subsequently corrected it rather than project it. Too-tight clothing (common for me right now since I just had a baby 7 weeks ago), damp bra (see aforementioned – nursing) and dirty feet from walking around on my hardwood floors! I guess most of my triggers are sensory. Excellent post Alissa! I almost always can trace my blows up back to not enough sleep or improper nutrition. Hate letting my own decisions affect my kids, it’s something I need to think about late at night or when I am just too busy to stop and eat! Oh, my. Thank you so much for this article! Oh yes, I have a few triggers. One for me is too much noise. I can’t stand too much noise and first thing in the morning is even worse. I’ve learned wake up before my kids and enojy a few moments of quiet so I can start on the right foot. This is me as well. Way too much sensory overload. The tv a bit to loud, dog scratching at the back door, combined with the 3 yr old trying to grab something from your table when you have coffee on it, and your 8 and 10 yr old arguing. At 8am. Before you’ve had a single sip of said coffee. Or gone pee. A dirty house gets me going, especially when coupled with a lack of sleep. Both were issues today, but I remained calm in tone and demeanor and we all felt better for it. I just need to keep trying to improve and set a good example as how can we expect our children not to have a temper if we do? Such a great thing to think about. On the top of my head I can think of: messy house, toys all over the floor, kitchen counters and dining table covered with clutter, kitty litter stuck to the bottom of my bare feet, entryway full of shoes! This is me exactly! 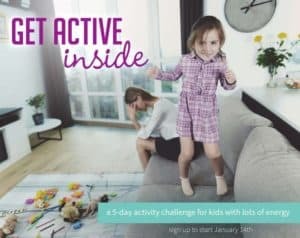 I also find that if I don’t exercise I start to resent my kids and my husband and I feel even more irritable! 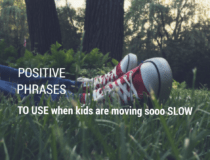 I am trying to work on this one by exercising WITH my kids! This is me! I wondered if someone else had that as a trigger! For me its visual clutter. If the house is messy, if a table is covered in misc stuff I get angry. Visually its too distracting for me and my mind can’t just focus on what needs to be accomplished for the day so I get angry. My desk at work is almost always cleaned off at the end of the day and when I come home and the house isn’t super messy-just lived in- I get tense and I hate that because when I am on my way home I feel normal and fine and then when I walk through the door I get tense. We decided that during the summer I call home at lunch and give the kids 2 jobs and that helps with trying to keep the house together. I’m so glad you wrote, “visual clutter”! We live in a small house and I have two kids (12 and 2) whom I homeschool. I can feel blood pressure rise and I get hot flashes when my house gets too cluttered, stuff lying everywhere. I believe my anger lies in the feeling that I’m being taken advantage of because things are not being put away by the one who took them out. I have to talk myself through it, “It will be OK, they are just kids, we will pick it up in 30 minutes, it only takes five minutes to get it clean, etc” LOL In short, feelings of being overwhelmed and or wasting my time, sends me over the edge. Besides obviously taking time to sweep and trying to get the crumbs from breakfast spot-swept before the got tracked around, I coped by delegating the sweeping at least 2x week to hubs a higher priority if i couldn’t get to it rather than trying to get it in the following day. I also could take a moment to put on socks or get out for awhile! I like your list of sensory/physical triggers, but why don’t you discuss emotional triggers? For me, those are so much more of an issue. Granted, I’m more likely to lose it when the physical stuff isn’t managed, but doing the real deep work of emotional self-care is just as, if not *more* important. It isn’t easy, and requires brutal honesty with oneself, but the payoffs are huge. Why do I lose it when my kids don’t do what I’ve asked for the fifth time? Why am I more likely to snap at them when their behavior embarrasses me? For me, unmet and unrealistic expectations are much more likely to trigger me than anything else. Scrutinizing my expectations and letting them go has been huge for me in allowing me to stop my chronic yelling. Emotions are huge too, I didn’t purposefully leave them out…I suppose when I was thinking of the list above I was thinking about the way moms will sometimes neglect really simple things like getting a glass of water or putting on a sweater and wind up being more angry or upset than they otherwise would have been had they not taken care of bare physical necessity. I think that in order to value ourselves and take care of ourselves we have to take a look at the habits we might have of neglecting these basics. Thank you always for adding your insights! This is SO me as well!! I know I probably have physical triggers too, but these emotional ones (esp about managing expectations) are HUGE. And those specific instances you mentioned are where I lose it exactly. Thank you for helping me to feel less alone! 🙂 I have resolved this year to do just what you said – examine my expectations and adjust them accordingly so that I can stop constantly yelling. I agree with the emotional aspect. I yell at my three year old when she’s acting like a punk. Plain and simple. It’s her behavior that sets me off but it’s my emotional reaction that comes from a deeper place. If I were as zen as I’d like to be when my three year old jumps on the bed repeatedly next to my four month old’s head, I’d set her on the ground and calmy say “you are behaving dangerously and you could hurt the baby by doing that. Don’t do that anymore” instead I just yell “stoooop it!! !”…I just lose my cool super quick when my words don’t register with her. Its like, “listen child, I know what I’m talking about” but how can she know that, she’s three. Yes – our kids can sure hit that deeper emotional place in us can’t they? And I think the Danger/Anger link is really strong too. it hits that “mama bear” button. I Just started to go to the gym to work out. I have gained some weight, starting to focus on me. What we eat, how I react, or when I feel I am about to yell..Now I tell my son I love you, or I do a silly dance. Today I beat my hands against my chest and pretended I was a gorilla. He laughed, and giggled and did the same thing. I tell my self not to yell, I am teacing my son to yell. 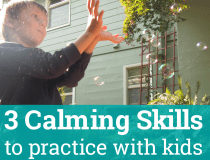 Some things to do instead: the hokey pokey, Laugh, play hide and seek, clap until the feeling of yelling is over, yell at the cabinet, or into a hall closet. I am a single mother, need to blow off some steam…I started to work on what makes me get to the point of yelling. I tell myself daily, not to yell, we do not need to go there. At the end of the day, it really feels good to know that I wwas able to keep it together. I love my son very much. Tonight he went into bed at 8 pm, he kept calling me, wanting me to put him to bed. I wanted to yell, we had a very long day out and about. Instead I went into my Nicholas’ room, looked at his face, got doown on my knee,, we rubbed noses together, I told my guy that Iloved him very much, more than the moon the stars and the earth, his eyes were closed, he fell asleep. That very special moment we weill have. The one where you want to stop time, just for the second. I hpoe this helps. I agree, it is a choice. We are not powerless. A hug may be just the thing we need. I just screenshot your entire reply to remind myself of the examples you give. Your post here actually made my eyes tear up… there are days I remember to calm myself, it’s just a moment and I turn it around to that beautiful memory like you did. That feels amazing! Thank you for sharing. It’s a lovely reminder with great examples. I think for many women, especially organized ones, a mess is a surefire trigger; a messy outside renders us incapable of having a tidy inside – our thoughts n plans get muddled n confused. this leads to frustration n anger. But I dont think we need to be too hard on ourselves w/ re: to this trigger. In a solid family unit, everyone should be trying to eliminate each other’s triggers so that we can co-exist happily. But if your own family members (hubby, kids etc.) are totally insensitive to your triggers (the “just deal with it” attitude) then its only a matter of time when your anger bomb explodes all over them. No matter how many times I ask my husband to put his shoes ON the rack, not in front of it, he chooses to ignore me; no matter how many times I remind my family that we do not live in a hotel and I am not room service, that we must pick up after ourselves, I always find my husband leaving his leftovers on the table, for someone else – guess who? – to pick up. A family is like a car, with four wheels. every wheel needs to pull its weight for the car to move along. If the mom is the only wheel that is pulling her weight, the natural consequence is breakdown. Just coz we r doing most of the yelling does not mean that its all our own fault. Another trigger can be deeply buried underlying issues that havent been addressed. I often find myself getting angry at my kids about silly little things, and when I take the time to figure it out I realise it is my anger at my husband about our failed relationship that was the actual cause; the kids’ silly behaviour was probably just the final straw, not the real problem at all. Lastly, our yelling can be a remnant of our own childhood; I grew up with a mom who seemed to hate every fibre of my being, and being yelled at, insulted, humiliated, punished for things I’d not done, and so on, was the norm for me. While I try very hard not to replicate her behaviour, and thank God my relationship with my kids is fabulous compared to the non-relationship I had with my mom, every now and again my childhood rears its ugly head and I behave toward them as she did toward me – yelling, glaring, just losing the plot completely. I always beg their forgiveness afterward, and am taking huge doses of B vitamins (esp. Vit B3) to try and rectify myself, praying to God constantly to help me. Months can go by without any ugly incidents, and then as you say, something triggers another yelling spasm. May God forgive me, help me, and bless my kids for all their patience and forgiveness. Thank you so much- your whole reply is my situation exactly. I’m crying right now after having screamed like a banshee at my 10 yr old. Sending her into school with tears eyes and shaken up is not my idea of a good parent, so I am dealing with a lot of shame and guilt right now. I want to go pull her out of class and mend our relationship and make it all ok. But I’m taking some time to figure out why this happened, and can already see that visual clutter is a major trigger and I walked into 4 spaces this morning that were not how I usually keep them. But the emotional aspect… this is a big one. Even as I yelled at my child a part of me was thinking , this is NOTHING Compared to what I endured. We don’t hit, slap or dole out big punishments- we pretty much go on the “I respect you- You respect me” rule. And it works. Until my daughter does something that I would have been massively punished for. I keep it together, reminding myself I’m breaking a cycle here, and respond from a different place. It’s hard. But worth it. But when I’ve done it over and over and over I hit my limit. Needing to go to the toilet is my trigger!! I can completely relate to the noise trigger. I also start getting edgy when the clutter starts to build up around the home which is why I try to stay on top of clutter every evening. I also think that if I am not drinking enough water my mind gets cloudy and distracted and that can lead to higher frustration levels. Great post, Alissa. Thank you for writing this post. I really need to think about what my triggers are because I’m tired of being a grumpy mom and I feel that my kids deserve better. I absolutely get irritable when my blood sugar is low (I know this for certain because I am a diabetic so I can test and see the low number and connect it with my mood!) Even knowing this, I am not always good about carrying snacks with me and making sure that we all eat at regular intervals. It’s one more area of self-care that I neglect when life gets hectic (which is exactly when I should be paying most careful attention to it). It still surprises me to realize that all I needed to do was sit down, eat a healthy snack, drink a glass of water and give myself a couple minutes to regroup, and I will be in a MUCH better mental state. Why can’t I remember that in the moment?! Other triggers are things mentioned by others: a cluttered house, a high volume, not having had a good night’s sleep… not surprisingly in a house with 3 young children, all of these things happen daily! But another very significant one is being in a hurry — it can be difficult to get out of the house so we often cut it close when we need to get to school or an appointment and that raises the stress level enormously. If only I started getting everyone ready earlier, the process would be so much more peaceful. I wish you the best Zoe – I know, I too am usually surprised by the simplicity of what I needed to re-center. A snack, a drink of water, maybe a few breaths of fresh air does wonders. the hard part is the times when what I need is time to myself and it’s SO hard to get. I’ve got to get better about planning more childcare ahead of time so i get those kinds of breaks too. This is such a great article, thank you. I’m currently pregnant with my first child and have been reading all sorts of silly articles about how to parent and discipline children. My partner and I live with his family because his father is disabled and his brother autistic. This article really put the sensory overload problems into perspective. As I do not work my brother-in-law can really bump heads. Autism is all about sensory overload but I never considered my own sensory overload. This may help us find a happy medium in our home before the little one comes. Wow. 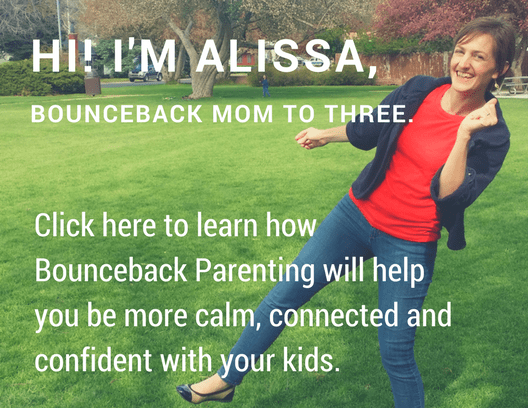 What a great article, Alissa! I was just thinking about this today. You give great tips here and I can totally totally relate with noise being an overstimulating trigger for me. Whining is also one. Normally that means more snuggle time is needed, but sometimes when I’m in a position where snuggling is impossible (like cooking over a hot stove) and there is whining and everyone is hungry, I’ve realized I’m prone to a meltdown. What I love most about your article is that you emphasize recognizing the signs of overload well before the meltdown. I think so many articles focus on what to do when we’ve gotten upset which I think, at that point is a little late! I focus on recognizing the signs early because it’s a major weakness for me. I tend to push and push and think I’m fiiiiiine, and then hit the wall BAM. 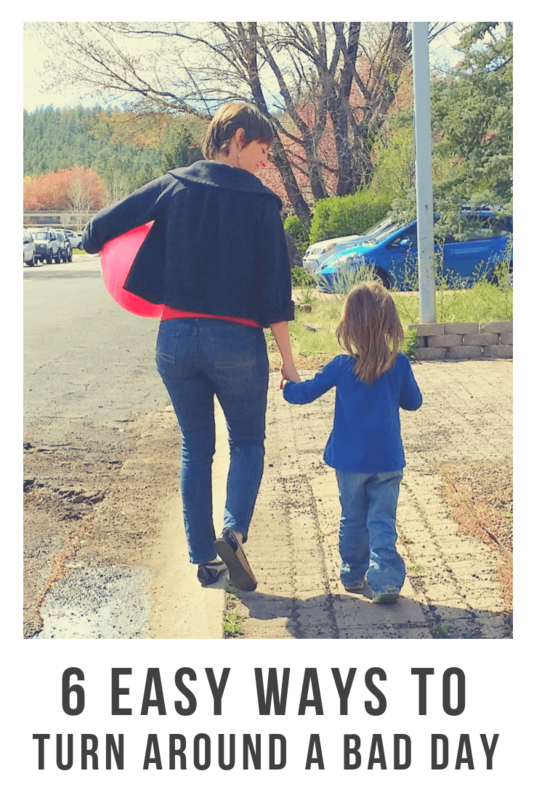 Noticing earlier and being proactive has been a really big parenting lesson for me, and I’m definitely still working on it. Wearing pants that don’t fit comfortably on my waist! I call any pants that fit like this “angry pants” and they make me much more unpredictable! Gotta lose weight or just wear sweats for now…ha ha. Glad I found this site today. I have a lot to read here. Blood sugar all the way. I’m currently trying to move our mealtimes up by an hour, b/c I’m getting cranky by 11am and 5pm! Eating earlier = happy momma = happy kids. What do you do when you have too many triggers? I cannot avoid all my triggers because there are too many and some of them are not things that are “bad” (such as the normal noise of being in a small house with 3 kids–sorry but they can’t be outside all day every day). I need to learn to desensitize myself to the triggers. This is an awesome article. 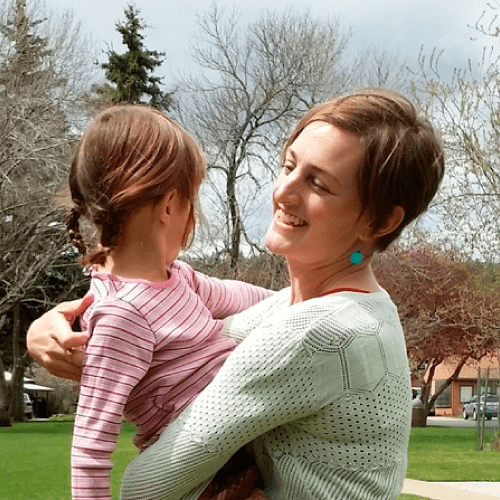 I saw it posted on pinterest and it 1–has helped me to take a close look inside myself to see what triggers me and 2–helped me feel buoyed by all the other moms who find themselves struggling to improve in this area. Very rarely do my friends (or sister) ever talk about getting upset or yelling at their kids. I was feeling like I was extremely abnormal and destroying my family. It’s really comforting for me to know I have fellow moms here who are on a similar journey as I am. I was raised in a not very supportive, often angry, home. I don’t remember my mom ever putting me to bed (my dad did, sometimes, if he was around). There are a lot of elements around bedtime that are triggers for me. And that’s what I’m trying to figure out and work on right now. Cause I often just have to walk away from my kid’s room and threaten them to not come out. That’s not how I want them to end their day, and I often feel so guilty in the morning. One suggestion I have for those moms who struggle with noise. Those shooting range headphones! My husband bought them for me (we don’t have/use guns) when my 3rd was a baby and we were living in a small 1 bedroom apartment in NYC. All 3 of my kids would cry and I was going bonkers. I would put those headphones on and I could take a few deep breaths and handle the kids so much better. I carry them in the car now. Seriously…buy them! I think my main triggers are sensory. Loud noises, the kids being wild running through the house and playing dangerous put me on edge. I have two boys ages 6 and 4. They get wild pretty often and I don’t get a lot of sleep. My husband has been on a second shift job for almost 4 years and has just now gotten a 1st shift job. I’ve learned that he handles the wild and crazy stuff much better! If I can find a quite place to sit and breath deep for a couple minutes I can normally calm down and handle the situation. I’ve also noticed that when the boys don’t listen or obey me I take it to heart as they don’t care enough about me to do as I ask. I have to keep reminding myself that they are children and don’t mean anything by it. I’ve also learned that when I’m about to my breaking point and I’m about to yell at them, if I can remember a good christian song at the time (which doesn’t always come easily) and sing it I can calm down and remember what my goals are as a parent. I hope some of these ideas will help someone else. This article was written for me. I have coined the term ” cranky Mommy” with my kids when I have gotten to the brink of being frustrated because I am doing it all without much assistance from the kids or the husband to be able to keep the house clean,the toys picked up, and things in a semi organized fashion. This was such an eye opener to get out of the cycle and recognize before it takes me hostage! Thank-you Alyssa. I have really been enjoying your blog! This was me today! My toddler son was being extremely picky about eating pretty much everything today. Then he took out our budgies’ food bowl from the cage and dumped it on the floor, repeatedly pulled the same items down off a shelf onto the floor, etc…all while I was trying to make dinner (which he protested about eating, so then I made him something else). I yelled at him. Loudly, and more than once. He yelled back at me once. Then I felt terrible and cried my eyes out. He is being a toddler. I am being cranky about it. I work with toddlers and I do not (and cannot) yell at them. So I feel VERY guilty when I yell at my own child. Having 2 previous miscarriages makes me feel guilty when I yell at him too. I know I am human, and I can lose my cool sometimes. But it just makes me feel so awful. Thank you so much for this site! Reading everyone’s posts made me feel so much better! I thought I was the only one who screamed at her kids! I hate doing it but find myself doing it anyway. The intensity of my anger scares me sometimes. I feel like such a failure as a mom. I grew up in a household where my dad was abusive & always yelling & I still bear those emotional scars. I never wanted to do that to my kids. We have 4 adopted children ages 3, 4, 6 & 6. Two of them have ADHD and ODD. One of them has PTSD and anger issues. We wanted to give them a good life and they dont deserve being yelled at all the time. I have fibromyalgia and severe chronic hip pain from a failed surgery. I work full time as I am the breadwinner for our family. Our house is always messy & dirty to the point where I cannot let anyone visit. My triggers are messiness and noise and there is plenty of that here! Thank you again for this site where I feel I can get the support of other moms dealing with the same issues! I have the same issues. Pain makes me more irritable. Also their bickering makes me stressed and hurt more. This is a good post. I’m with you on the noise. When my baby cries, the sound really annoys me. I guess its because I take it as I couldn’t understand him or why he couldn’t understand me. I think my expectations for both of us too high. I have the same issue with wind: it grates on my nerves! The constant sound (whoosh, clonk, tap-tap-tap, etc), the feeling of vulnerability, the alertness, the sheer chaotic, arrythmic effect (just like jazz. I hate jazz because its arrythmia makes me angry, even after 5 minutes). Lol. I hate jazz and wind too. Weird. Wow. I am sensitive to noise. Never considered wind an irritant. 3. I am not having a blood-sugar drop. Otherwise quite anything can trigger me. Mine is definitely visual clutter. I HATE clutter and mess. It makes me feel a loss of control and I can only handle it for so long and I lose it. Especially when I feel like I’m the only that cares about the mess. Great post! I have found that recognizing my own triggers is a wonderful (and sometimes scary) way to work on myself. I ponder on why this particular thing is a trigger, what feeling memories does it conjure up for me. I also like a Jungian technique that over exaggerates the trigger. For example: if clutter is a trigger, I will intentionally add more clutter, even delight in the process of cluttering. Then I sit with it without trying to fix it or figure it out. I just sit and focus on relaxing and opening myself up to whatever comes to me. I also like to say out loud “That’s a trigger!” The kids laugh at me sometimes but I hear them start to say it too. When I say it, it becomes less mysterious and frightening. Then we can talk about it openly together. Parents being human is the hardest thing for kids (and often adults) to accept. I love your idea to say out loud, “That’s a trigger!” So helpful! You hit on something so important – that ability to make anger less mysterious and frightening and instead move towards it being an emotion you can get to know and learn to work with. Thanks for your contribution!